On an overcast, humid warm morning, I stepped back on the Appalachian Trail for the first time this year. My hiking partner today was May “Dynamite” McDaniel, a 71 year-young thru-hiker from my hometown of Columbus, GA. May began her quest for Katahdin on March 16. After some early difficulties, which included several days away from the trail to adjust her food planning, Dynamite has been steadily working her way north. Prior to her departure I had promised to meet her along the A.T. and slackpack her a few days. Today I kept that promise. We started our day with a drive to Devil Fork Gap, a road crossing between Hot Springs, NC and Erwin, TN. The previous evening I had contacted my old buddy, Tom “10” Bradford and arranged a shuttle from DFG to Sam’s Gap so that we could walk toward my car. Tom was booked; however, his wife, Marie, was happy to provide the service. After the short transport, May and I were walking south a little after 9:00. It didn’t take long for the trail to remind me of its difficulty. Still, after an early climb out of the gap up to a ridge, the A.T. provided my hiking companion and me a rather gentle path throughout most of the day. Early in the hike I suggested to May that we play my favorite trail game, over or under on the number of hikers we would see. Pilgrim and I had often occupied hours on my thru-hike of 2013 keeping tabs on the number of other backpackers that we met or that passed us. Dynamite happily played along, selecting the “under” when I chose the number 15 for today’s walk. Perhaps this seemed a rather high number considering we were only hiking 8.5 miles, and it was a Monday with rain in the forecast. My reason for proposing 15, however, centered on the fact that we were southbounding and most thru-hikers were headed north. The day passed quickly. Sharing stories from the trail, we reached the Hogback Ridge Shelter in a little over an hour. Along the way we were met by several northbound hikers including my friend Bon Bon’s son, “Doogie.” May knew some of the hikers and introduced me as a former thru-hiker and author of two books. Among the many that we met, I especially enjoyed chatting with Popsicle, a young lady from Oregon, and Preacher Man, a very young Episcopal priest originally from Birmingham. When the priest noted that he was almost out of food and not going to be able to re-supply until the following day, Dynamite offered him some of her provisions. May obliged. As I lay there surveying the situation, I immediately thought of Speck, my good friend, and occasional hiking partner on my thru-hike. She would have been laughing mercilessly. I even smiled thinking about my predicament. Within a few minutes I was back on the footpath, headed south. Although more embarrassed than injured, I still felt grateful not to have been hurt more seriously. Had it been in New Hampshire or Maine, I might have never been heard from again. I can’t believe that I fell on such a simple section of trail. Then one never knows what danger awaits on the A.T. When the the road at Devil Fork Gap came into view, the number of hikers we had seen was still at 15. Then as we rounded a bend and spotted the parking lot, four hikers were preparing to head our way. I had won the game on our first day on the trail. We had met 19 folks, all thru-hikers. Even with my roll down the side of a mountain, it was an OK day. It felt good to be back on the A.T. I’ll re-evaluate the back later this evening, but my plan right now is to hike again tomorrow. And if I do I’ll try to pay closer attention to flat sections of trail with no obstacles. That’s what got me today, so I need to make sure it doesn’t happen again. On the first of May I decided to start writing again in this blog. I did so for a few days and then stopped. Originally, I had several reasons why I wanted to start writing again. I missed writing. I wanted to establish some kind of goal as I turned sixty-six. I wanted to have a venue for my running aspirations. And I hoped again to generate some reading interest before I returned to the Appalachian Trail for a few days. Since I haven’t updated the site in over two weeks, I suppose it would be appropriate to comment on what’s been happening in my world. My running injury has improved, and I’ve been able to log a few 4 mile runs at a 9:15-10:00 pace. I’m content. At this stage in my life, running is more for cardio than for competition. As long as I raise my heart rate for 35:00-45:00 four or five days a week, I’ll be happy. For now, however, I want to get back to talking and writing about the trail. Yesterday morning I departed Columbus and drove up to Waynesville and then Maggie Valley, NC. I stopped by Muddabbers to see my good friend and owner of the pottery studio, Brad Dodson. Then I ventured up to Davenport Gap to offer some trail magic to a 2017 thru-hiker, May McDaniel. May, or Dynamite as she has been dubbed on the trail, has several reasons for tackling the challenging Appalachian Trail at the young age of 71. You can read about her goals and the adventure at destination100.com and on her Facebook page under Destination 100. Like her page and send her some encouragement. Right now I’m writing this entry from Damascus, Virginia, argueably the “best” trail town on the entire A.T. Dalton, MA and Hanover, NH might challenge; however, most folks give the honor to Damascus. For the next three days I’ll be selling my books at the author tent in the city park at the Trail Days festival. I’m also on the program to speak at the Town Hall, Friday, at 7:30 in the evening. It should be fun. After Trail Days I plan to join May for two or three days of hiking. I also hope to hook up with two other acquaintances who are in the midst of a thru-hike attempt. Aaron “Pawki” Wilkes is somewhere just south of here, and Steven “Rooster” Riecker is already in Pennsylvania. Rooster is raising funds and awareness for ALS in honor of his good friend, Roger, who was diagnosed last fall. It’s good to be in proximity to the trail. For the next few days I’ll try to document my Spring, 2017 A. T. adventure. But for now, I think I’ll lace up my trail runners and go for a short hike. After all, the trail is just out my front door. Sometimes plans have to be changed. While slowing making my way through a five mile run early yesterday afternoon, I began questioning just what I was doing. Even though the groin only felt mildly uncomfortable at a agonizingly slow pace of almost 11:00 a mile, I quickly realized that to run faster would be to risk further, and perhaps greater injury. So I accepted the consequences of the setback and continued to run at the easy pace. After completing the run, or jog seems more appropriate, I walked the final 1.6 to achieve my 6.6 mile goal for the fourth day of May. With twenty-seven more days remaining in my birthday month, I’m really not sure it’s worth the risk of a more serious injury to continue with the probably ill-conceived goal. Maybe the best, and by far smartest decision, will be to rest a little and then continue running when the affected area feels better. As I ponder the options, I’m reminded of my younger days when buddies and I differentiated running from jogging by pace. I remember an article in a running magazine that defined running as any pace under 8:00 minutes per mile and jogging as over 8:00 per mile. At a time when I rarely trained even over 7:30 a mile, this definition seemed about right. 8:00 and slower miles were meant as “cool-downs” after more serious training. That was then; this is now: my 9:00 pace seems “fast” for this almost sixty-six year-old. 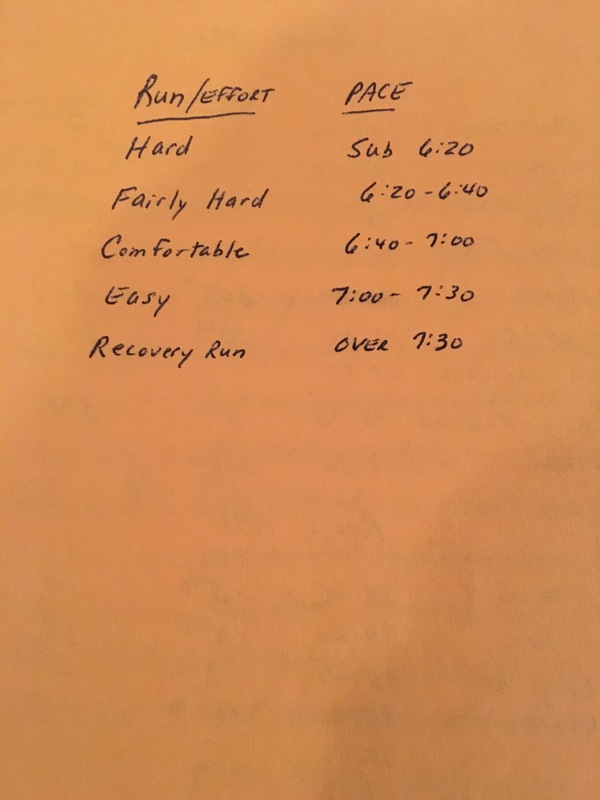 Speaking of pace from my very serious training days, I recently found a chart I had included in one of my running journals that I have kept since 1980. I had penned two columns. In one there were the words: Run/effort and in the other: pace. As odd as it may sound, I can still see myself running at the sub-6:00 pace, just like I can see myself sinking fifteen-foot jump shots and hitting forehands with accuracy to the back corner of the court. Unfortunately, we age. Just like my basketball and tennis talents faded years ago, now so has my running pace. I’m not begrudging; in fact, I think I’ve accepted the aging process as it relates to the sport I love. I keep reminding myself that I’m fortunate to still be running at any pace. Like I often stated in my journal when hiking the Appalachian Trail, I believe things happen for a reason. Maybe I was supposed to have a minor set-back at this point in time. My wife and I will be traveling up to New York tomorrow to visit our daughter. I had looked forward to a run in Central Park one morning and another along the Hudson River. I’ve run in both places on several other occasions, so maybe I just need to enjoy time with family and appreciate walking throughout the City. Not having to pack running clothes will also lighten my suitcase slightly. I’m obviously looking for any positives in an otherwise negative circumstance. There will be other times to run in New York. So today I’ll walk. And I won’t worry about distance. I’ll do the same over the next few days, or maybe rest entirely, if need be, after the trip. Whether I cover 6.6 miles any of the next few days won’t really matter that much in the big realm of things. What will matter is that one day soon I’ll be running again. And hopefully, I’ll be running “fast,” at least by my definition as an “older runner.” There are days to run for years to come. I just have to take my running days like all days in general, one day at a time. As I walked 6.6 miles yesterday afternoon, on a relatively flat path, and without a pack, I thought about where I was four years ago on this day. On the evening of May 3, 2013, I took up residency for two days in the Big Walker motel near the town of Bland, Virginia. It met all the requirements for comfort, at least from a hiker’s perspective. After back-to-back 23.0 and 21.7 mile days with a full pack, any room with a bed would have sufficed. A few other would-be thru-hikers were there as well. One, a German, sadly admitted that it looked like his adventure was over. When he limped away, barely able to put pressure on his left knee, it was obvious why. Looking back on my journey from Springer Mountain in north Georgia to the summit of Mount Katahdin in Maine, I continue to be reminded of just how fortunate I was to elude serious injury during the duration of my walk. After experiencing some groin discomfort on a run two days ago, I’m also reminded just how quickly a setback can occur. In the spring of 2013 I was a soon-to-be sixty-two year old. Now at almost sixty-six, I constantly monitor my movement, not expecting anything to happen, but always cognizant that something could. Before embarking on the Appalachian Trail thru-hike attempt, I had made sure that I got myself in the best shape that I possibly could. I ran four or five days a week and hiked at least three. On most of the hikes I carried more weight than I expected to tote on the A.T. I ate like a hiker while preparing as well. Knowing that I would most certainly lose weight over the five-plus months I would be on the trail, I tried to consume more calories and even gain weight before my departure. Fortunately, I never experienced any kind of injury during my training days. Still, when looking back, I’m somewhat in awe of what I accomplished on May 2 and 3, four years ago. When I hit the trail near Atkins, VA that first morning, my goal was to reach Chestnut Knob shelter, 23.0 miles away. The previous evening I had purchased a bag of Arby’s roast beef sandwiches in Marion, VA, and I made sure I had re-supplied my jelly beans for a quick pick-me-up, should I need it. Ever since that eventful day in the Smokies when two young folks, and fellow Georgians, had offered a handful of the sugary candies, I had not traveled without them. Nutritious they weren’t; a source of instant energy they were, at least for a little while. And I would need the energy often throughout the day. As I say in my second book, The Don’s Brother Method, if I were going to hike this section again, I would break it into three days rather than two. But that is hindsight. When I reached Chestnut Knob shelter I was exhausted. I remember feeling sincerely thankful that one bunk remained open in the totally enclosed stone building. It was cold, but it was dry. I also remember feeling a little uncomfortable, and maybe even slightly embarrassed, when I broke out my roast beef. Had it not been almost dark and cold and windy, I may have taken my meal outside. But since all but one of my fellow shelter-mates were section-hikers, I figured I’d probably never see them again after that evening. As I recall, most were already in their sleeping bags when I began to spread barbecue sauce on my sandwiches. Even with my fast-food evening meal, the next day would be a challenge. When I arrived at the highway near Bland on May 3, I was about as depleted as at any time in my life. I felt even worse than I had after finishing marathons. I had walked 21.7 miles with little food. But I made it. Now, I’m still recalling how grateful I was when Bubba, a shuttle driver I had phoned, arrived to drive me into Bland. Every day on my hike was memorable for a variety of reasons. This one was because of a bear-sighting and a riggety truck that transported a weary hiker to a room. It’s been raining here since before daylight. I’m itching to get out for a run and test this groin issue. It feels good now, so I’m thinking an easy effort awaits. I’ve done the 6.6 miles each of the past three days with a run, a walk, or some sort of run/walk combination. I suppose I should wait for the harder rain to pass. Regardless of the weather, I’ll be out running and/or walking sometime today. There were days on the Appalachian Trail when I walked over 20 miles in the rain. Surely I can withstand an hour of the same today. As a coach I often expressed to my athletes the importance of setting both short-term and long-term goals. For the aspiring distance runner to reach his/her full potential, a training regimen that imcorporates a variety of workouts is essential. I can still hear myself challenging young men and women to aspire to do well in an upcoming meet, but to also ultimately be planning for the regional championship event later in the season. I emphasized that both goals were important; however, the one three or four months down the road significantly meant more than the one for the next day. That was the thirty-something year-old coach talking. Now the “almost” old man thinks differently. At this point in my life, I’m convinced that the only goal that really matters is the one set for today. What happens two months, or even two days, in the future really carries little importance. I was quickly reminded of what should be a “live for today” philosophy about 8:00 A.M. today. Perhaps a goalless future should be my focus. Just twenty-four hours ago I set a somewhat long-term goal of moving on foot for at least 6.6 miles each day in the month of May to “celebrate, mark, or lament” my sixty-sixth birthday. Without really thinking through what I was doing, I carelessly posted my “not really that ambitious” goal on this blog. Despite having countless times reminded myself not to share goals publicly, I foolishly did. And I did so without having wood nearby to “knock on.” I don’t really believe in jinxes, but if I did, I’d say at about this time yesterday, I jinxed myself. After a rather lengthy layoff, I chose to resume writing on this website for several reasons at the beginning of my birthday month. I’ll share more of those reasons in future posts, but for now I want to continue to chastise myself further for my writing about this running, walking, hiking goal. It may have to be altered (I do say “may”) due to a word that I cringe to even utter, “injury.” Albeit, hopefully only a very minor one, still I “may” have to re-evaluate that ill-conceived long-term goal. Yesterday’s 6.6 miles went just fine. I walked to a nearby park, ran 4 miles as I had planned at a respectable 9:18 pace (for an “old man”), walked some in the park, and then walked home. The walking totaled just over 2.6 miles, so on May 1, I had started well with my 6.6 miles met. I couldn’t have felt better. The slightly cooler temps after the storms refreshed me. My mind accelerated throughout the workout, leaving me not only feeling physically refreshed, but mentally smiling as well. So on an almost crisp morning today, I eagerly looked forward to a six mile run with an old running buddy from over three decades and a newer running friend only slightly older than a third of my age. Steve, the elder friend, and I often competed for age-group awards in the ’80s. He still trains with intensity, and when running with my old buddy every Tuesday morning for the past three months, I’ve discovered new enthusiasm and a desire to run “fast” again. Tino, the younger runner, is just beginning to realize his potential. Patiently listening to Steve and me re-live some of our younger racing days, he runs ahead at intersections to ensure that no motorists will fail to yield to our trio. Today I was running about as well as I have in months until around mile 4.5. The sub-9:00 miles felt great, and Steve and I took turns telling the stories as Tino seemed content to listen. Then I began to feel an uncomfortable annoyance in my left upper groin. I later said to my two companions, “It’s taken over thirty-seven years for me to have a groin injury.” Honestly, I can never recall even a soreness in that area. I’ve strained quads, calves, and hamstrings, had tendinitis in a variety of joints, and suffered from a sore hip ever since I fractured my femur in 1996, but I can never remember a groin issue. I first slowed my pace, telling Steve and Tino to keep running. Then at five miles I decided it best to walk. I did finish the 6.6 with the combined run and walk; however, I’m not sure if my “lofty” goal will be accomplished. I’m not giving up yet. I’ve iced the area, taken an anti-inflammatory, and plan to rest, at least for a while. Fortunately, there’s no pain or soreness when I walk, so tomorrow afternoon I’ll go for a stroll at a comfortable pace to test it. If all goes well, I may try to run a little on Thursday. What I won’t do is share any more long-term goals in this blog. And for that matter, maybe I won’t make any more either. On second thought, that’s impossible. I already have some things I hope to accomplish on the Appalachian Trail later this spring. I just won’t talk about what those things are until they have already happened, and if I mistakenly comment on something I plan to achieve in the “distant” future, I’ll definitely make sure that I “knock on wood” when doing so. On a dreary Monday morning, in the midst of a rather serious thunderstorm, I’m contemplating in what direction I want to travel over the next several months. Wherever that may be, I’ve decided that I would like to write about my journey and share these musings with whatever reading audience that remains from those who followed my thru-hike of the Appalachian Trail in 2013. Perhaps I’ll pick up a few new readers. Then again, there is also the possibility that I’ll lose a few along the way. Neither really matters that much. I just feel like writing, with or without an audience. So today I write without real purpose. These will be ramblings that may offer a glimpse into where I’m headed, mentally and physically, at this juncture in my life. In two weeks I will turn sixty-six, an age that I have thought about for the past few weeks. Every spring when another birthday is inevitable, I seem to begin thinking of myself at the new age rather than at the present. Since early March I’ve moved on from sixty-five in my mind even though I’ll still be the age when I became eligible for Medicare until the middle of this month. With aging in mind, I’ve decided that I need some kind of unusual goal of motivation for the month of May, 2017. Since I’ve begun running fairly well again, I want to focus on exercise. A few years back, a friend celebrated his 60th birthday by running 60 miles, biking 60 miles, and swimming 60 laps in a lake over two days. I’m not nearly up to that kind of commitment; however, I have determined that I would like to make 66 a part of my regimen. Therefore, my goal for May will be to accumulate at least 6.6 miles per day moving in some way by foot. That may be running, walking, or hiking. I specify “at least” because I’ll probably surpass the 6.6 on many days. With this plan in mind, I’m reminded of a conversation that another good friend and I have had recently. As we age, there are only two goals that we have determined are really important when running or walking……Don’t fall and stay healthy. The second was actually, “Don’s get injured,” but I’m trying to accentuate the positive. Later this afternoon my plan is to run 4 miles and walk 2.6. Each day will most likely be a little different, and I’m looking forward to the challenge. Later this month I’ll be back on the A.T., at least for some day hikes. At the moment three of my acquaintances are attempting thru-hikes. I hope to meet each at some time in May somewhere along the trail. After spending only 19 days of a 164 day hike in the woods, I determined that it would be appropriate to share my method of hiking with anyone interested in pursuing a similar type of thru-hike of the Appalachian Trail. After working on the manuscript for over a year, my second book was published in the summer of 2016. I believe that the title, The Don’s Brother Method: How I Thru-hiked the Appalachian Trail and Rarely Slept in the Woods, speaks for itself. Since its publication I have continued to hike occasionally, travel a good bit in proximity to the A.T., and speak about my adventure, my brother, and my books. I have had the privilege to address audiences in my home state of Georgia as well as in Alabama, Tennessee, South Carolina, North Carolina, Pennsylvania, and New Jersey. I will add Virginia to that list this spring when I speak at Trail Days on Friday evening, May 19, at 7:30 in the Town Hall of Damascus. If you have any questions or comments about my books or would like to schedule me for a speaking engagement, please contact me at donsbrother4@gmail.com. Thru-hiking the Appalachian Trail is hard work. Writing, editing, and publishing a book about thru-hiking the Appalachian Trail is hard work as well. Although certainly of a different nature, this writing project that I have been engaged in for the past six months has at times required almost as much perseverance as the hike did. Obviously the physical component that was needed for the hike did not factor into the latest endeavor; however, patience played a major role in both tasks. So now, some six months after completing my thru-hike and almost a year since I began it, the book is ready for distribution. While hiking the trail from March 23 to September 2, 2013, I wrote daily about the adventure. One of my goals from the outset was not to miss a day of recording the events that had unfolded. Even though I wasn’t always able to post immediately to trail journals and my website every day, I was only late in posting a few times. Therefore, at the hike’s conclusion I had written 164 entries, one for each day on the trail. After resting for much of the remainder of September, I began in earnest to edit the journal in early October. Almost three months later that part of the task was complete. In addition to re-writing sections from my journal to include more description, dialogue, and insight into some of the nuances of thru-hiking the A.T., I also interspersed stories about my brother, Don, throughout the book. After all, Don was always the main reason for the hike. Then after the manuscript was ready, the publishing process began. The folks at Create Space, an independent publishing company associated with amazon.com, have been extremely helpful in all respects. They have worked with me on interior design, marketing techniques, and are assisting in distribution of the book. A good friend and graphic designer, Jenny Horton, designed the cover. Don’s Brother: A Hike of Hope on the Appalachian Trail is now available at http://www.createspace.com/4560368 . The book will also be available at amazon.com and other outlets within the next few days. I plan to update my website often with additional information. The book contains 342 pages including the Roman numeral pages at the beginning and will sell for $16.95. I plan to donate a portion of the royalties to the ALS Clinic at Emory Hospital in Atlanta in memory of my brother. I also plan to schedule speaking engagements and book signings whenever opportunities arise. Already I am scheduled to speak at a luncheon at my church, Wynnton United Methodist in Columbus, GA, on Thursday, March 20 and at our Wednesday night supper at the church on March 26. I hope to be able to speak about my hike, my brother, and ALS often. When I speak I will also have books for sale at a reduced price and do signings as well. On the last day of the year that I successfully completed a thru-hike of the Appalachian Trail, I went for a hike. On a gray, rather cold morning, my old buddy Alton joined me on an 8.2 mile jaunt along a portion of the Pine Mountain Trail in west central Georgia. Returning to the place where I had walked many a mile in preparation for the AT hike seemed an appropriate way to close out 2013. After all, hiking occupied much of my year. From practice hikes in January and February to the thru-hike from mid-March to early September, I spent much of this past year in the woods. Even though today’s was my first hike since summiting Katahdin, 2013 has been the year of the hike. So after a hearty breakfast at the Callaway Gardens Country Store, Alton and I walked up the highway to the western terminus of the Pine Mountain Trail. Over the course of the next four hours my good friend and I shared stories of family, friends, and the Appalachian Trail. It was all good. The overcast sky in no way detracted from the camaraderie. We had the trail to ourselves, seeing only a few others on the somewhat bleak day. This wasn’t the AT, but it was a trail, complete with crumpling leaves, roots and an occasional stream to rock-hop across. Once again I felt in my element, even if only for a brief time. I walked today using only one trekking pole. Alton carried a hiking stick. I wore a small daypack with Gatorade and water inside. Even though I had hiked in shorts almost exclusively on the AT, I wore long hiking pants today. Despite the cold, the day was comfortable. The blazes were mainly blue or red, the climbs were minimal, but it was still a trail through the woods. These were the woods where my brother Don had also walked in what now seems like another lifetime. Don may be gone, but the woods are still here. As I spoke of the thru-hike with Alton I found myself missing my trail friends. I’ve kept in touch with some; others are merely memories. I don’t even know the “street names,” as Susquehanna Slim calls them, of many. At one point I failed to see a root and fell. I don’t guess a day of hiking would have been complete without a fall. A couple of minutes later I grazed an overhanging limb with my head. Smiling, I thought about the day in Pennsylvania when an unseen, protruding limb had almost knocked me out. Today’s trail was not the AT. Nevertheless, it had its obstacles. At the end of the hike, after saying so long to Alton, I drove home. There were no trail towns along the way. I thought about the nearly four months that have passed since that last day in Maine. I thought about the book project that is almost complete. I remembered days when I had to watch every step for fear of falling. I planned future hikes, not certain when they will occur. But mostly I just appreciated the year that is coming to a close later today. I reminded myself just how fortunate I was this year. I walked 2185.9 miles, all northward, on the Appalachian Trail. I was never sick, I sustained no significant injuries, and I met so many wonderful people along the way. For those who followed the journey as well as those who hiked along with me, from Don’s Brother, I would like to wish all of you many days filled with wonderment as this year concludes and another arrives. Happy New Year, my friends! For the past two weeks I have busied myself with editing parts of my journal in expectation of publishing my writings as a book. The endeavor has been a challenging one. When I was hiking the AT, recording a summary of my day on the trail became second nature. Even when I faced exhaustion or when the hour was late, I somehow found the time and energy to write. And all the writing was accomplished on my iPhone. Now, at a computer and in the comfort of my home, there are often distractions, both physical and mental, that are keeping me from the task at hand. Concentration escapes me. I wonder why. As I replay events from the hike I continue to find myself wanting to be back in the woods. This transition back into the “regular world” for a 62 year old retiree has been difficult. I have even wondered if I need a job. I’m always busy and never bored; however, perhaps some routine responsibility would help me take my mind off the trail. So anyway, I’m editing. I don’t have a publisher and have been told by a couple of reputable authors that I may need to self-publish. Either way, the book will become a reality within the next few months. I’m just as determined to publish a book as I was to finish the thru-hike. In fact, there were many times when the thought of completing the hike in order to publish a book motivated me to keep walking. Don inspired me first. The possibility of sharing his life and my hike with others kept me going as well. For now I’m trying to embrace the idea of finishing a book with the same tenacity as I did finishing a hike. Like the hike, the book is a goal I need to fulfill. The hike took 5 months and 10 days to complete. The book may take longer. Time will tell.